I’m talking about the orange fencing, not the guy on the bike. 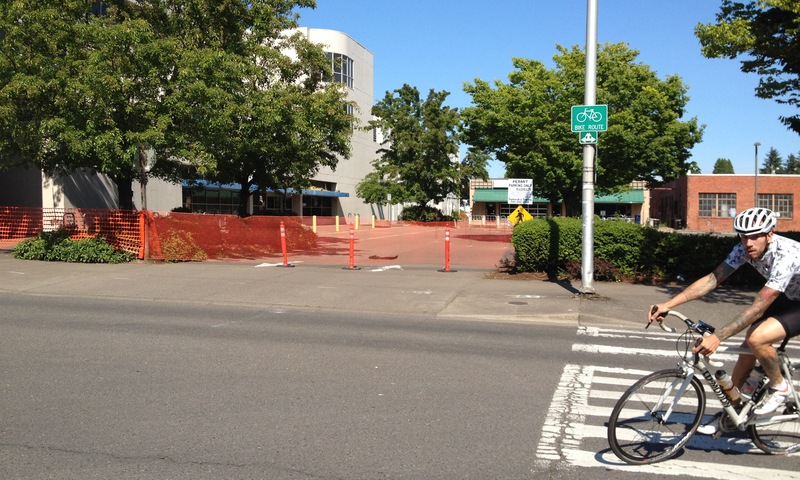 We suspect construction is beginning on the Capstone student apartment complex so they have blocked 12th Avenue through the construction site between Olive and Willamette. I just noticed this last night and didn’t have time to check with the city on the particulars. If anyone out there from the city is reading, you can leave a comment if there’s anything to add here. As I remember, Capstone actually purchased this alley from the city and plans to build a bikeway through here. But I’m guessing it’s all going to be under construction for, what, probably a year or something. I guess this leaves us with 15th and/or 13th-and-11th as the best east-west routes through downtown. I’m thinking this is going to annoy some people, because of all of those east-west routes, I’d say 12th is probably the sleepiest — probably the best for people who don’t like to mix it up with traffic. Thoughts on other alternative routes from the west-of-downtown neighborhoods to campus? Can’t believe this is happening. As someone who sits on the BPAC and has been involved in giving input to the city on this project we heard nothing about this. I even raised this as a concern when the purchase was made saying that this should not be closed and heard nothing about it actually happening. Would they close 13th or 12th to cars?! You can see the clear Bike Route sign right in the photo! Other options? 15th? Way out of direction. Broadway? Not as comfortable/convenient and not connected to UO. 11th? Not comfortable/safe. 13th? Only one way. Now, how about we close one lane of car traffic on 13th and create a temporary two-way cycle track?? That’s a solution I could get behind! Well, for all I know at this point, this could be a brief temporary thing. I don’t know. Waiting to hear from city folks. Rode by a little while a go and the fencing had been torn down at both ends, Apparently unpopular. Hmm. Yeah, this whole thing maybe could have been handled better on the city’s part. Ug…really? More than a year, assuming the project stays on track? I don’t think I can recall even one motor vehicle routes being blocked for that long due to construction of a building. I’m annoyed but not surprised as accommodating as the city claims the developer has been that detour information didn’t get in place before construction/demolition started. Blocking a bike/ped corridor for years at a time still seems acceptable to our gold level community but we have at least been getting some detour signage. I’m guessing the walks will all be blocked before long through the end of construction as well. I’ve begged and pleaded that this default designed corridor get improved as part of this project that will dump hundreds of new daily trips on it but I’m expecting the same level of results and then a tax payer fix in a decade. The proposed design makes safety for the existing corridor worse. Hopefully I’m wrong and we will still all be surprised by a rebuilt corridor worthy of our community. Sooo, that sounded bitter enough. Let me color may grey cloud a bit. First, I cringe when I hear generic terms like the ‘City’ since the ‘City’ is made up of many departments charged with different functions and individuals with differing areas of expertise. I personally find it easier to throw darts at the ‘City’ boogie man than people constrained by departmental functions and code restrictions but don’t like to do it and don’t like it used as a tool by anti-tax advocates. But I did anyway. Partially out of frustration and partially because sometimes the complexity gets in the way of the simple as parts of this instance points out. I’m only speculating on some of this but the detour work we have been getting on city construction projects has been through public works as part of their bike path construction projects. Since the Capstone construction is private, Public Works are not involved in the current phase of demolition / construction so they would not have it in their budget or schedule to do detour design and implementation. The permit and information center and the building inspectors who would most likely be responsible for plan review and guiding this project through the implementation process may have no mechanism for developing bike detour planning and signing. They also have no good way of requiring it of the developer since bike route detours are not really required in the code and this stretch is now private instead of public with a use agreement after construction. Requiring this as part of the alley vacation may have been a possibility but I think at the time things were moving fast and bikes were far from decision maker’s minds. The Transportation Planning Dept. including bike ped people have been involved in guiding this project but again, not sure of how sharp, if any real teeth they have and their scope stops at the end of the block….or just across the street. In this instance the frustration that the departments can’t cross pollinate better to make integration of these larger developments into our community is frustrating and makes me want to blame the ‘City’ as a collective (ours being similar to most). I think it can be a learning opportunity about where we can try to focus energy. The lesson could be to realize that hands are tied by departmental boundaries and codes and so we need to find ways to get the codes to do what we want. An important step would be to get recognized by accepted triggers with teeth like having bikes and peds included in transportation impact studies for new developments (key) and getting bike ped corridors treated as real transportation corridors when being closed for construction by private developments. In my more perfect world the people who work at the city and really care about bike/ped mobility would have enough clout to mandate action that keeps human power modes flowing with the same consistency as the automobiles and would have a budget other than grants and project specific bond measures. Ideal worlds aside, the first couple would require projects that impact capacity to make off site system upgrades and to maintain the system’s operability during construction and that would have been a tremendous help with this project. and on and on I ramble…..
Well, sure, if you’re gonna be all reasonable about it! What I meant is simply giving some warning via the Bike-Ped Advisory Committee that this was going to happen. But, yeah, maybe since it’s now private property they didn’t know. I really can’t blame the contractor for not wanting the liability of having people riding thru their construction zone. Just better communication would have helped. A little. Maybe. Thanks for the reasonable comment. I’m struggling to temper my responses to such things! Any number of staff positions should have seen it coming and gotten it on the radar of somebody. I feared it was coming any day just by reading the paper. In-Motion, GEARS email list and BPAC should have been notified. I’m sure collaboratively somebody could even scrounge some discretionary funds for detour signage. Ultimately they will have to but before construction would have been appropriate. The featured guy riding is none other than a fellow Luke and one of Eugene’s finest bike racers, Luke Demoe. Thanks to the OregonLive article, I went back and refreshed on some of your early blog entries. I had forgotten that you had called this section of bike path “Mr. Skinner’s Wild Ride.” I wonder what the future has in store for this treasured Eugene attraction. Agree 100% with Shane! 2-way cycletrack on 13th! With students back now, the whole area is a dangerous mess, someone could die. Someone already has in front of Kinkos! Saw a dad with a trail-a-bike trying to negotiate Willamette-11th nightmare around it without death. How to get the cycletrack done: gather a petition with 100s of signatures (gather many from frustrated cyclists at the intersection, etc.). Take it to the Eugene city council public forum on Monday nights and present it to the council with lots of statements from mad moms and their kids just asking not to be killed. Get the TV, RG folks to take pictures of the kids and moms and students, etc. at the lethal intersection. Get lawyers to threaten the city/developer with lawsuits should anyone get hurt.